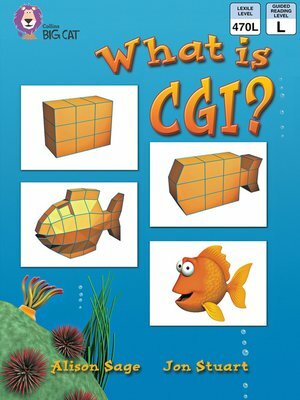 Collins Big Cat – What Is CGI? Artist Jon Stuart shows how he produces computer-generated images. The process starts with a simple block of cubes, which are added to, given texture, before being bent, stretched, twisted into the correct shape and size. He then adds background, lighting and colour to bring the whole scene to life. â?¢ Orange/ Band 6 books offer varied text and characters, with action sustained over several pages. â?¢ Text type - An information book. â?¢ A flow chart on pages 22 and 23 summarises the process, and there is a contents page on page 1, as well as a glossary and index on pages 20 and 21. â?¢ Curriculum links - Art and Design: Investigating different kinds of art, craft and design. ICT: An introduction to modelling; Creating pictures.